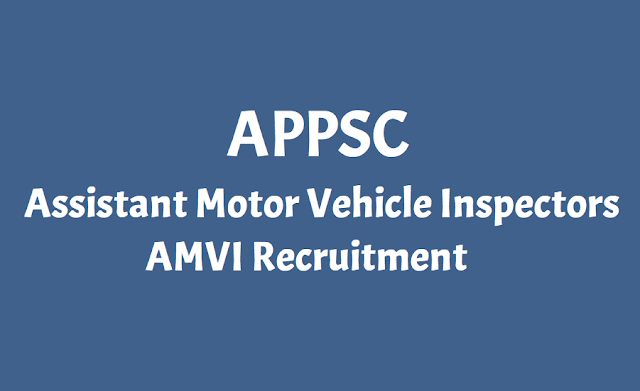 APPSC Assistant Motor Vehicle Inspectors(AMVI) Recruitment Hall tickets, Main Exam Date 2019: APPSC Announces Recruitment Of Assistant Motor Vehicle Inspectors and Application to begin on December 12. Andhra Pradesh Public Service Commission (APPSC) has released official notification for recruitment of Assistant Motor Vehicle Inspectors in AP Transport Subordinate Service. The recruitment will be done for 23 vacant posts out of which 17 are fresh vacancies and 6 are carried forward vacancies. These vacancies are not open for physically handicapped candidates. If the applications received by the commission is more than 25,000, the commission may conduct an offline screening test followed by a Main examination, otherwise only a Main examination will be conducted. Note: If the commission decides to conduct an offline screening process before the Main exam, it will communicate the date for the screening test separately on the official website. The candidate must have a degree in Mechanical Engineering or Automobile Engineering from a recognized University or should hold a Diploma in Automobile Engineering issued by the State Board of Technical Education and Training, Andhra Pradesh or Technological Diploma Examination Board, Hyderabad or Any other equivalent qualification. The applicant must also hold a Motor Driving License and have experience in driving motor vehicles for a period of not less than 3 years and possess Heavy Transport vehicle endorsement. READ | How to Apply for APPSC AVMI Posts Recruitment 2018. The lower age limit for these vacancies is 21 years and upper age limit is 34 years as on July 1, 2018. Note: Applicants are advised to go through the official notification for detailed eligibility criteria and relaxation on upper age limit. a) For Men (SC/ST and Aboriginal Tribes): The minimum height must not be less than 160 Cms. and must not less than 83.80 Cms. round the chest on full inspiration with a minimum expansion of 5.00 Cms. c) Each eye must have a full field of vision. d) Colour Blindness, Squint or any morbid conditions of the eyes or lids of either eye shall be deemed to be a disqualification. iv) Candidates with knock knees, pigeon chest, flat foot verycose veins, hammer toes, fractured limbs, decayed teeth shall be deemed to be disqualified. Candidates who fulfill the eligibility criteria prescribed by the commission will have to first fill the OTPR application (if not done already) to generate OTPR id. After receiving OTPR id, candidates can apply for the Assistant Motor Vehicle Inspectors recruitment by logging again.